Are you a regular at the 5am spin class, or head to the CrossFit box for your WOD after work? No matter how you stay active, Presidio® SPORT was built for you. Speck designed its brand-new iPhone 8, 8 Plus, and X case for your fitness-focused lifestyle. It has three layers of protection against drops, a no-slip grip, 360-degree port protection, and Microban® anti-microbial technology. Speck’s Presidio cases protect against everyday drops, but we saw a need for something more for hard-core fitness enthusiasts. They need an extra-grippy case that won’t slip during a run, protection against dirt and dust, and a way to keep the gym funk off their phones. Presidio SPORT delivers all of that and more. Presidio SPORT is a protective case at its core, with three layers that absorb shock on impact to help protect against damage from drops up to 10 feet. We start with a polycarbonate shell and add a layer of IMPACTIUM™ rubber inside the case. We then form that IMPACTIUM rubber into ridges on the perimeter that compress on impact. The outermost layer is made of a grippy silicone called IMPACTIUM Sport. It has a soft-touch feel and helps prevent your phone from slipping out of your hand, even when you’re working up a sweat. No one likes the smell of a gym bag. The mix of sweat and bacteria that causes odors can get onto your phone case too. That’s why we infused IMPACTIUM Sport with Microban® anti-microbial technology, which inhibits the growth of hostile bacteria that causes stains and odors. Presidio SPORT stays looking good and smelling better, even through your most intense workouts. Whether you’re exercising indoors or out, your phone is bound to encounter dirt and grime during your workout. Presidio SPORT is equipped with 360-degree port protection to keep dirt and dust away from your phone’s ports, buttons, and mute switch. It’s perfect for trail running or weightlifting with chalk on your hands. 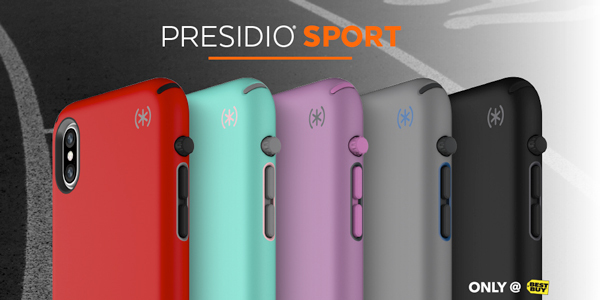 Presidio SPORT is your phone’s perfect workout companion, with 5 color options to match your workout style. It’s available now exclusively at Best Buy stores and on BestBuy.com, starting at $44.95 for the iPhone 8 model. Presidio SPORT for the iPhone 8 also fits the iPhone 7, and the iPhone 8 Plus model also fits the iPhone 7 Plus. The case is available for the iPhone X as well. Pick one up today to keep your safe and clean while you exercise.